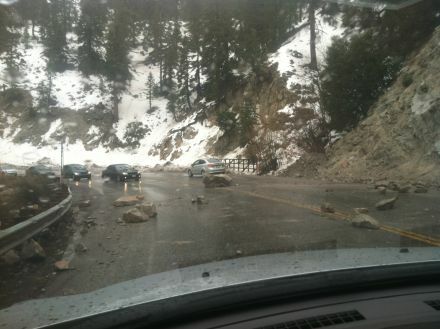 SCM Member NShore.Allen provided this photo of the rocks down on Hwy 18 in the Arctic Circle. As the heavier rains move in to the area overnight and tomorrow expect more of this! Drive with extreme caution in the areas prone to rock/debris flows. Thank you NSA for the photos!! actually from Sept 2013, watched the big rock bounce next to the grey car.. got away quick! Thanks for the date clarification NSA! One vehicle was hit today in that same area. Im sure it will be pretty messy after the heavy rain starts up.... Close Call!